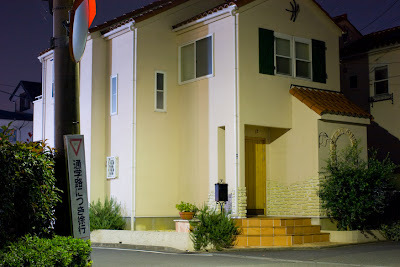 Case e villette che si affacciano sulle strade deserte nelle notti di un sobborgo residenziale di Tokyo: Home di Tomoyuki Sakaguchi (trovato su From this moment) esplora il tempo sospeso fatto del sonno della vita suburbana, dove gli ingressi degli appartamenti celano strani ospiti (automobili, scooter, biciclette) che sembrano spiare Sakaguchi mentre si aggira nelle notti dell’espansione urbana giapponese. Il suo lavoro digitale ci restituisce una luce clinica, dove i contorni sono rimarcati e le ombre non lasciano immaginare ciò che potrebbero nascondere, lasciando la sensazione di trovarsi in un teatro di posa durante le riprese di un film. 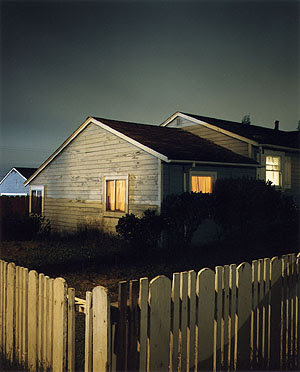 Vale allora la pena di ricordare, per chi non lo conoscesse, il lavoro di Todd Hido, dove la ricerca va in senso molto differente: nelle sue Homes at night (ripresa e stampa analogiche) la luce e le ombre della notte avvolgono le cose, mentre le finestre illuminate delle case ci lasciano ad immaginare quali vite stiano scaldandosi sotto i tetti spioventi delle loro case. Qui un video che ci mostra Hido al lavoro, qui un’intervista con Jörg Colberg su Conscientious. Houses and apartments overlooking empty streets in the nights of a residential Tokyo suburb: Home by Tomoyuki Sakaguchi (found at From this moment) explores the suspended time made of the sleep of suburban life, where the entrances of the houses hide strange guests (cars, scooters, bicycles) that seem like spying Sakaguchi as he wanders through the nights of the Japanese urban expansion. His digital work shows us a clinical light, where the contours of things are emphasized and shadows won’t let you immagine what they could be hiding, leaving you with the feeling of being inside the set of a movie. It is then worth to remember, for those who might not know him, the work of Todd Hido, where his research goes in a quite different direction: in his Homes at night (analog in shooting and printing) the light and the shadows of the night wrap all things, while the lit windows of the houses leave us wondering about the lives of the people warming under the sloping roofs of their houses. Here a video showing Hido at work, here an interview with Jörg Colberg on Conscientious. Sto guardando le foto di Todd Hiro. "...più che gente, sembrano foulard..."